Fruit and fish, plantains and potatoes, corn and coconut…these are some of the treasures of Colombian cuisine. I thoroughly enjoyed eating my way through the country and seeing different takes on staple foods in each region I visited. 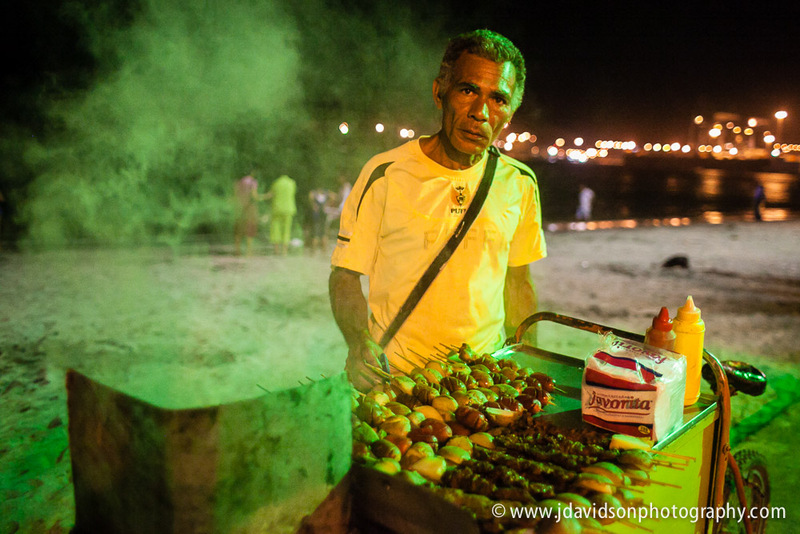 A food vendor serves grilled meats at the beach in Santa Marta. It is clear that people here are connected to and through their food. 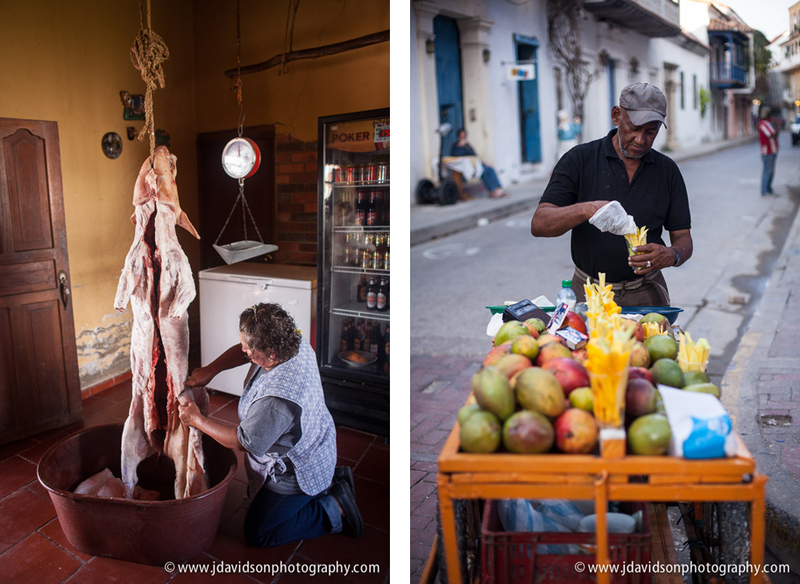 Street vendors selling fruit, ice cream, meats and arepas were ubiquitous in every town I visited. In the evenings, as the people congregated in plazas and parques, the air was filled with the melding of aromas from the various vendors. During the day, fruit vendors sold multiple types of mangoes as well as other fruits, an array of juices, and coconuts. There’s no excuse to go hungry here….fresh food is at every turn. Away from the cities, it was not uncommon to see people working the land and livestock to provide food for those in town. 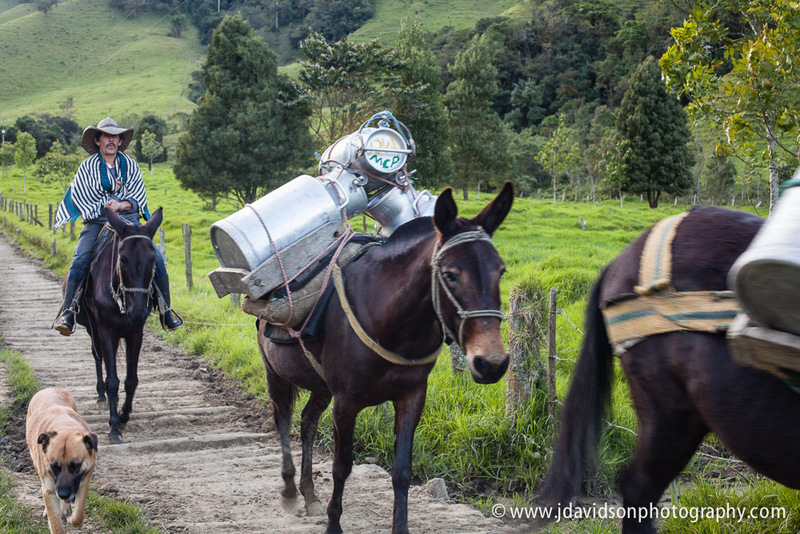 During a hike, I crossed paths with a man bringing milk into town in large stainless steel containers mounted on donkeys. This was the first of many similar scenes I saw, particularly in the Cafetera area, where many of the coffee farms and dairies are located. While visiting a small cafe near Villa de Leyva, some friends and I encountered a woman skinning a pig. It was such a beautiful scene, as light filtered into the room and she methodically processed this animal that would provide nourishment for many. A man makes the journey from his finca with milk to sale in town, near Salento. A woman processes a pig near Villa de Leyva (left). Mangoes for sale are a common sight on the streets of Cartagena (right). Fresh fish was plentiful in the coastal towns of Cartagena, Santa Marta, and Cabo de la Vela. In Cartagena, La Cevicheria served some incredible ceviche with shrimp, fish, conch, and octopus. Even though it was one of the higher priced meals during my time in Colombia, I could not help but return to eat there again my last night in town. Fried fish served with arroz con coco (coconut rice) and patacones (fried plantains) is a typical meal in coastal areas. In the Guajira area, we had several of these meals, where the only thing that varied was the type of fish. It was all incredibly tasty. Fried fish with arroz con coco near Cabo del la Vela is a meal typical of the area (left). 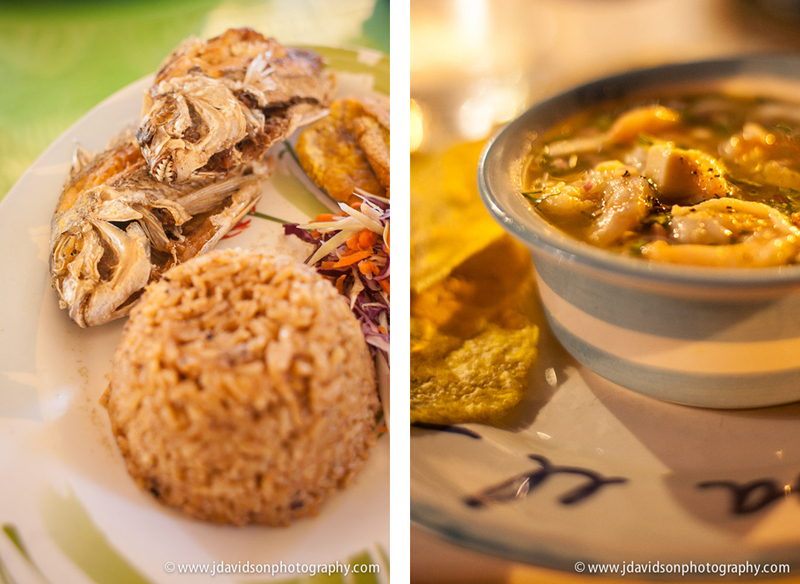 Mixed ceviche in Cartagena was a special treat at La Cevicheria (right). Arepas and patacones are two foods present throughout the country. Patacones are fried thinly flattened plantain patties. While in the coast they are small and served as an accompaniment to a meal, in La Cafetera, they are the size of a large plate and served as vehicles for any number of combinations of meats, cheeses and salsas. Corn based arepas vary greatly between regions. In La Cafetera, they resemble thick grilled corn tortillas, covered with meats, cheese, vegetables, or just butter. On the coast and in the regions around Bogotá, instead of piling food on top of the arepas, they are stuffed with meats, cheeses, eggs, or sweet creamy cheese. Many of these are grilled as well, but others are deep-fried. I made it my personal mission to try as many combinations as I could…within reason, of course! Arepas near Manizales in La Cafetera are served with butter alongside eggs for breakfast (left). 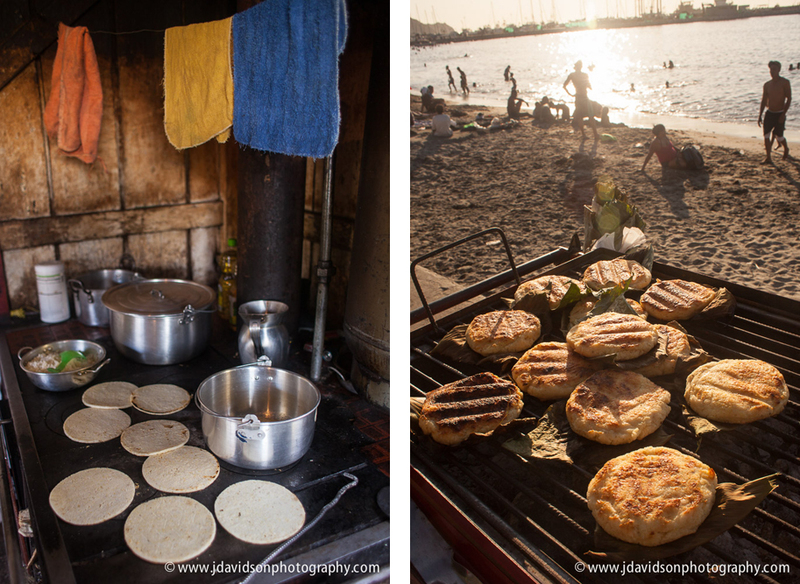 In Santa Marta, a street food vender sells grilled arepas filled with chicken or eggs to hungry beach goers (right). 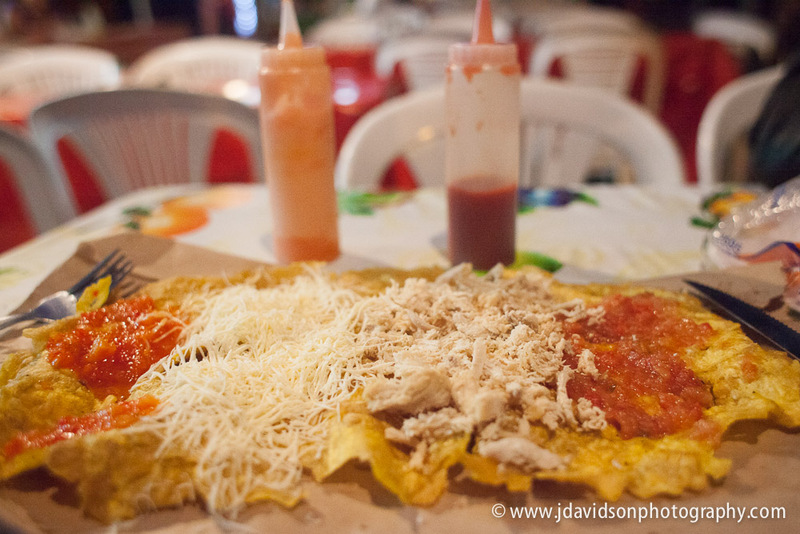 Patacones with chicken, cheese, and salsa serves as a filling dinner at the cafe-lined plaza in Salento.